OTTAWA – Captain Erik Karlsson scored two goals and Mike Hoffman had a goal and an assist to help the Ottawa Senators to a 4-3 win against the Toronto Maple Leafs at Canadian Tire Centre on Wednesday, extending the Maple Leafs’ losing streak to six games. The Senators (19-18-9) took advantage of some sloppy defensive play by the Maple Leafs in the first period to build a 3-0 lead on goals by Hoffman, Karlsson and Mika Zibanejad. Senators All-Star forward Bobby Ryan had two assists. The Maple Leafs (22-23-3), who scored two goals in their past five games, got a rare offensive spark with David Clarkson scoring his first goal in 15 games and Nazem Kadri adding a power-play goal early in the third period that cut the lead to 3-2. 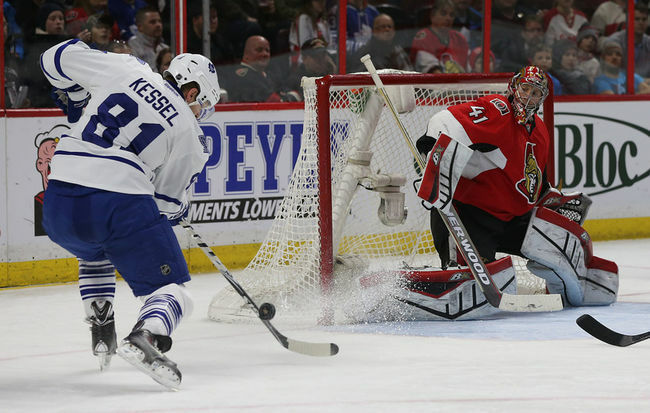 After Karlsson’s goal at 15:20 of the third gave the Senators a 4-2 lead, Maple Leafs forward James van Riemsdyk scored off a rebound with 1:23 remaining. It again was a poor start that doomed the Maple Leafs to another loss, their seventh in eight games since coach Peter Horachek replaced Randy Carlyle on Jan. 7. “The first periods are unacceptable. If we are going to become a better team, we have to learn to play 60-minute hockey and to play a whole game. We can’t play like this and expect we’re going to be getting better and moving up the ladder. Clarkson scored the only goal of the second period to make it 3-1 and was screening Senators goaltender Craig Anderson when Kadri scored on the power play at 2:36 of the third. Anderson made 37 saves. Maple Leafs goaltender James Reimer made 22. It looked like the Maple Leafs might get the start they were looking for when All-Star forward Phil Kessel broke in alone on Anderson early in the first period. But Kessel, who hasn’t scored in six games, shot wide. On the next rush up the ice, Hoffman scored when his wrist shot got through a screen by Maple Leafs defenseman Roman Polak and past Reimer high to his glove side at 2:02. The goal was Hoffman’s 16th of the season to lead NHL rookies. Hoffman and Karlsson then worked a beautiful give-and-go off a 3-on-1 to put Ottawa ahead 2-0. Toronto defenseman Cody Franson pinched on Ryan, but Ryan got the puck out, setting up the 3-on-1. Karlsson passed across the slot to Hoffman, who quickly returned the pass, leaving Karlsson for the open side of the net to Reimer’s right for his 10th goal. It was a good display of Hoffman’s quick feet and soft hands. He will represent the Senators at the 2015 Honda NHL All-Star Skills Competition in Columbus. The Senators lost 3-2 in overtime to the New York Rangers on Tuesday. Zibanejad took advantage of another odd-man situation to score his 11th goal off a pass from Ryan with 20 seconds left in the first period. The Maple Leafs play the New Jersey Devils at Prudential Center on Jan. 28. The Senators will face the Dallas Stars and former captain Jason Spezza at Canadian Tire Centre on Jan. 29.